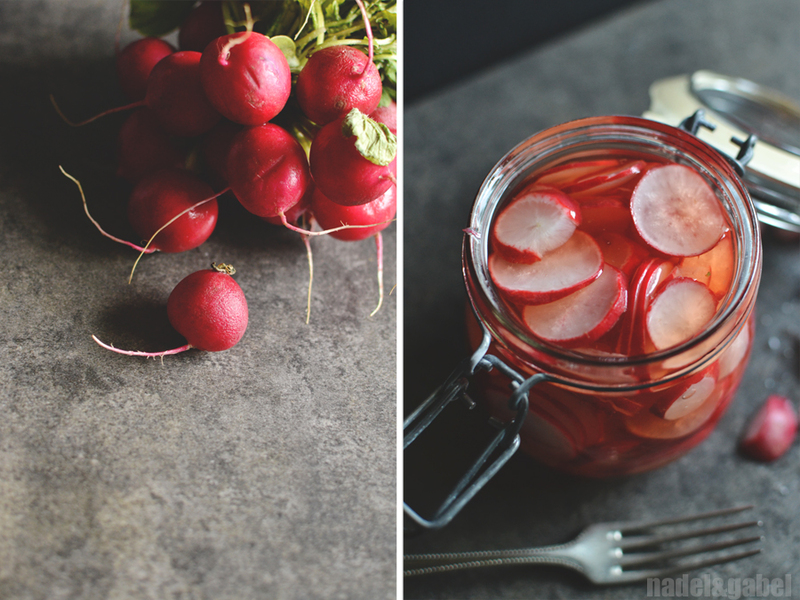 What can I say about these pickled radishes? 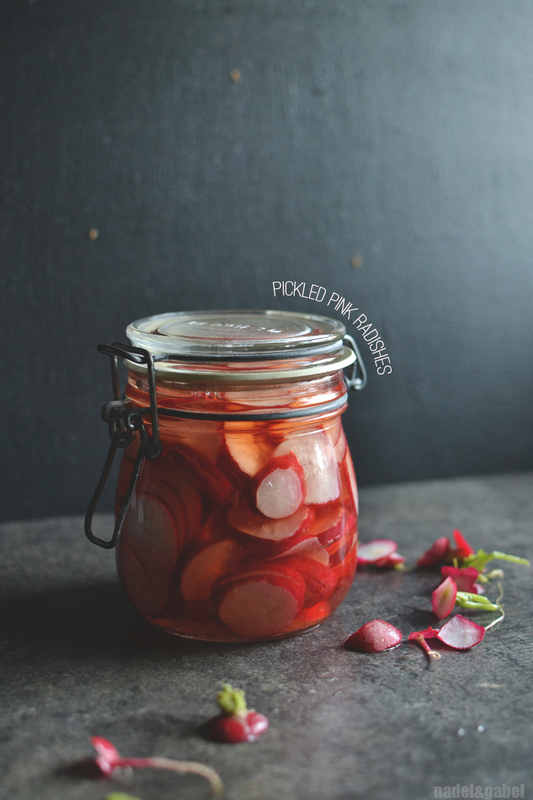 The sweet-sour pickling brine takes off a bit of the sharpness and adds tartness and a nice hint of sweetness. The colour of the red radish skin soon starts to diffuse into the brine turning again the white radish slices into pale pink ones. Originally made for Bánh Mì – yes, my version is following – I now eat them basically with everything: Scrambled eggs, baked potatoes, summer salads, and most loved: on top of a simple cheese sandwich that is multiple times better with this little addition. And although a typical South German Brotzeit or Vesper is only complete with some pickled gherkins, I nowadays leave this traditional path in favour of my Vietnamese-German cheese sandwich with pickled radishes. If traditions are meant to survive they must live – and living always means movement, change, adaption. Looked on a cheese sandwich this way, it holds some truth that points beyond itself. 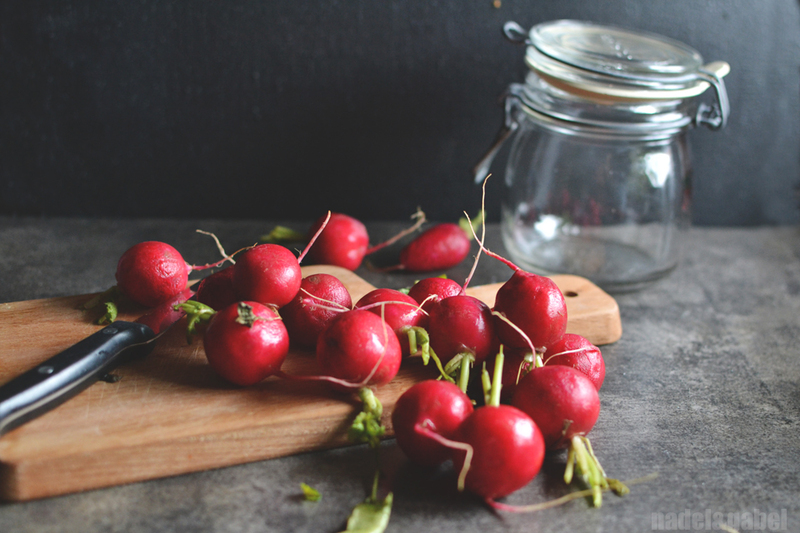 Remove greens and thoroughly wash radishes. Cut into slices discarding top and stem. Place in a clean jar holding ½ liter. In another jar or bowl mix vinegar with salt and sugar. Meanwhile boil water. Add boiling water to the vinegar. 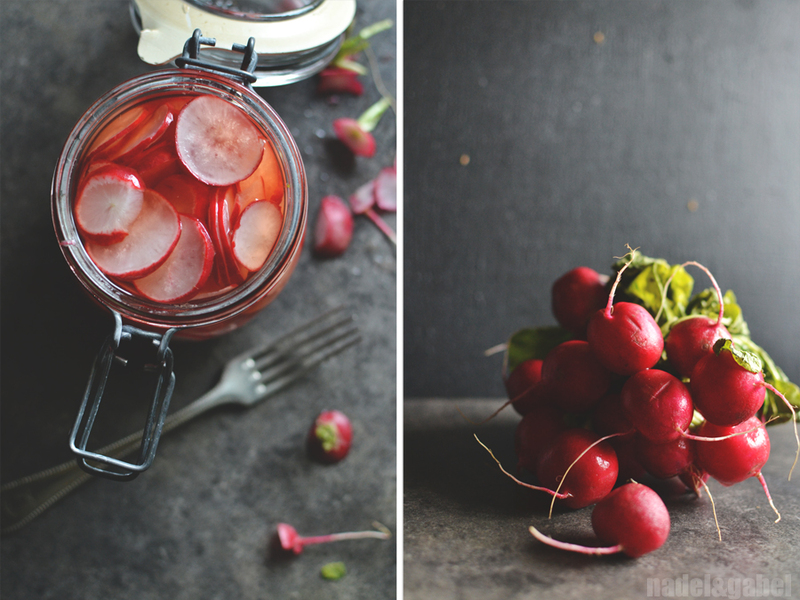 Pour over the radishes as soon as sugar and salt have dissolved. Take care that all radishes are covered with liquid. 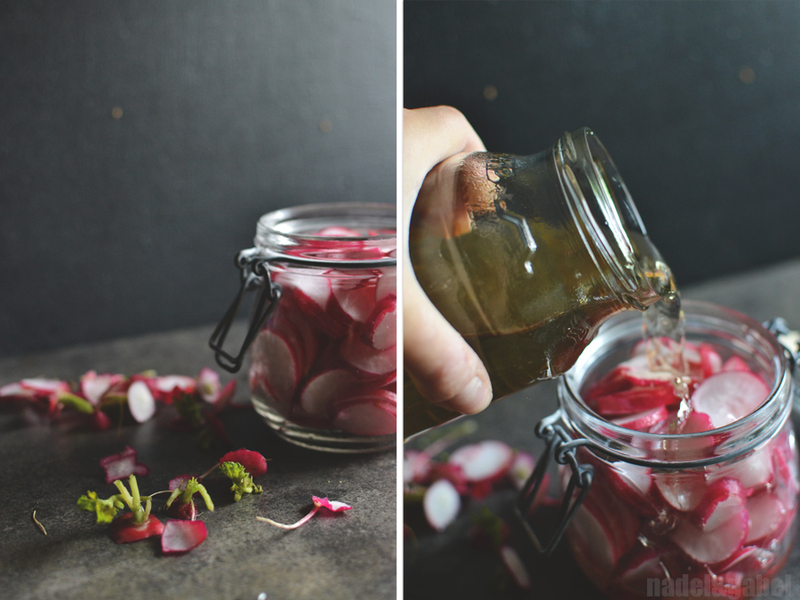 You’ll probably will be left with some pickling brine, depending on the slightly varying amount of radishes and the size of your jar. Either keep it for the next batch (that will be necessary sooner as you might think) or experiment with pickling other vegetables that you can find in the fridge. After a few days the pickled radishes will loose some of their firmness, but not their flavour. They keep for at least 2-3 weeks in the fridge. You’ll know that they’re over the top when you can smell some fermentation – but honestly: I’ve never reached this point. Oh wie lecker sehen die aus! Eine wunderbare neue Tradition, die ich vielleicht übernehmen werde. Danke für diese tolle Idee! Lustig, ich hab mich grad gefragt was wir mit den drei Bund Radieschen machen sollen an denen die Oma heute morgen auf dem Markt nicht vorbeigehen konnte. Und weils einfach schnell gehen muss gibts bei uns gerade sowieso fast jeden Abend Vesper. Wie schön, dass du kreativ an das Thema gehst. Bin mal gespannt wie das schmeckt! Das nenne ich perfektes Timing! Viel Spaß beim Ausprobieren.